The Global Volcanism Program has no activity reports for Gedamsa. The Global Volcanism Program has no Weekly Reports available for Gedamsa. The Global Volcanism Program has no Bulletin Reports available for Gedamsa. The Gedamsa (also spelled Gadamsa or Gedemsa) caldera spans 7 x 9 km along the Main Ethiopian Rift E of Lake Koka and SW of Wonji Sugar Estate Farm. The steep-sided edifice has walls 100-200 m high whose upper part consists primarily of rhyolitic lava flows, formed by the eruption of a series of trachytic ignimbrites, It is also cut by many NNE-SSW-trending regional faults, particularly on the E side. Late-Pleistocene to Holocene volcanics form a chain of rhyolitic lava flows and pumice deposits, known as Ittisa, that rises above the floor of the caldera. A large 1-km-wide crater is located at the eastern part of the chain. A Holocene lava dome or flow is found on the SW flank. Small basaltic spatter cones have formed inside the caldera rim. Weak fumarolic activity was reported at two locations. Berhe S M, 1978. Geological map of the Nazret area. Ethiopian Mapping Agency, 1:250,000. Peccerillo A, Barberio M R, Yirgu G, Ayalew D, Barbieri M, Wu T W, 2003. Relationships betweem mafic and peralkaline silicic magmatism in continental rift settings: a petrological, geochemical and isotopic study of the Gedemsa volcano, Central Ethiopian Rift. J Petr, 44: 2003-2032. The Global Volcanism Program is not aware of any Holocene eruptions from Gedamsa. 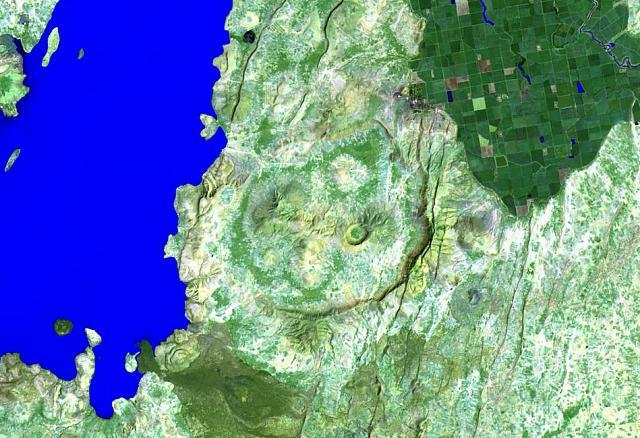 If this volcano has had large eruptions (VEI >= 4) prior to 10,000 years ago, information might be found on the Gedamsa page in the LaMEVE (Large Magnitude Explosive Volcanic Eruptions) database, a part of the Volcano Global Risk Identification and Analysis Project (VOGRIPA). There is no Deformation History data available for Gedamsa. There is no Emissions History data available for Gedamsa. Gedamsa caldera is located along the Main Ethiopian Rift east of Lake Koka (left) and SW of the Wonji Sugar Estate Farm (upper right). The 7 x 9 km wide caldera (also spelled Gadamsa or Gedemsa) is cut by many NNE-SSW-trending regional faults of the Ethiopian Rift. A chain of rhyolitic lava flows and a large 1-km-wide crater occupies the caldera floor. A young lava dome and flow is found on the SW flank of the volcano (lower left). There are no samples for Gedamsa in the Smithsonian's NMNH Department of Mineral Sciences Rock and Ore collection. Large Eruptions of Gedamsa Information about large Quaternary eruptions (VEI >= 4) is cataloged in the Large Magnitude Explosive Volcanic Eruptions (LaMEVE) database of the Volcano Global Risk Identification and Analysis Project (VOGRIPA).